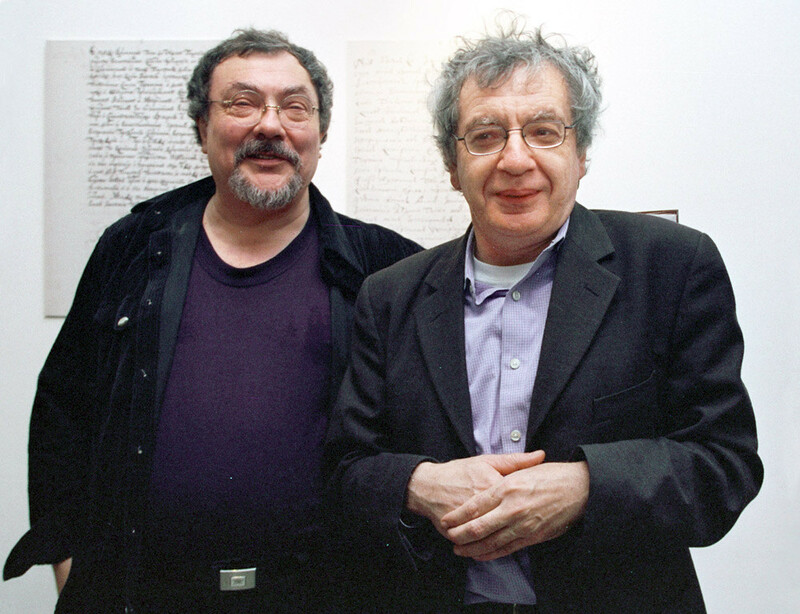 Vitaly Komar and Alexander Melamid founded one of the most iconic and ironic styles of contemporary Russian art, known as sots art. 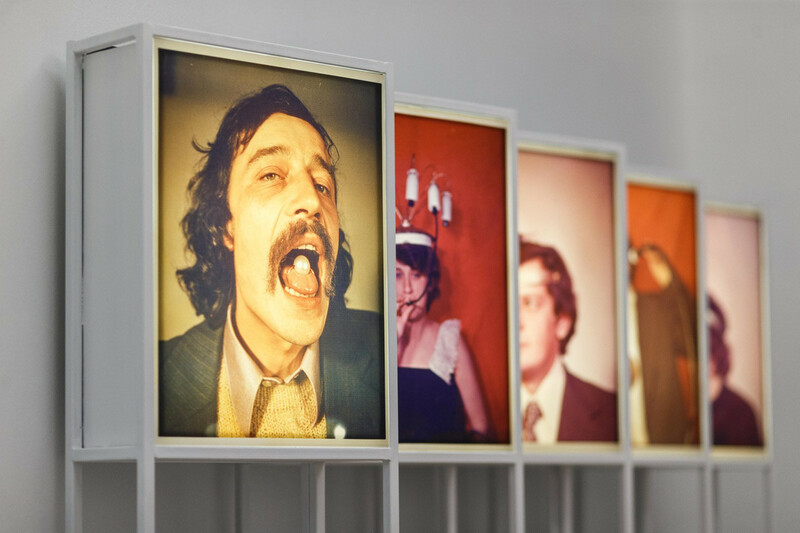 Back in the stagnant 1970s Moscow, artists riskily teased the Soviet authorities, portraying Lenin and Stalin in performance art, making “meatballs” out of the Communist mouthpiece newspaper Pravda, organizing the legendary Bulldozer Exhibition, and in the process inventing sots art. 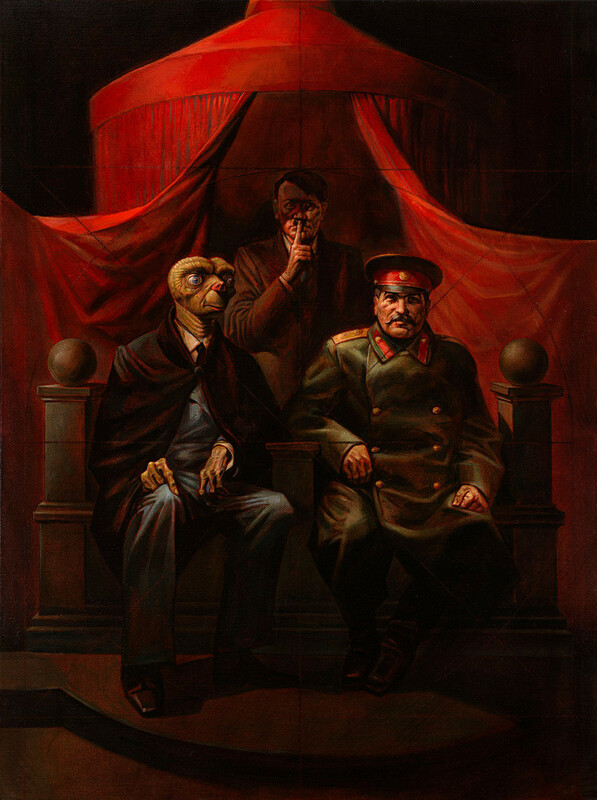 Sots art is considered a postmodern parody of socialist realism. Vitaly Komar (b. 1943) and Alexander Melamid (b. 1945) were the first in the Soviet Union to dare to poke fun at the authorities through art. At the same time, sots art became the ironic twin sister of pop art. If the latter arose as a reaction to excessive consumerism and the overproduction of goods, the former was a response to the overproduction of propaganda. In 1967, the Soviet Union held a string of events commemorating the 50th anniversary of Soviet power. Streets everywhere were adorned with red flags and slogans. And just as pop artists in the West were inspired by what they saw in the street – adverts for popular goods, likewise Komar and Melamid brought what they saw around them into the realm of art. What drove the emergence of sots art? The story behind sots art reads like a Russian anecdote. In 1972, when the USSR was celebrating yet another anniversary (this time, 50 years of the Pioneer movement), Komar and Melamid were commissioned to produce posters for pioneer camps. Work commenced in winter, in the unheated premises of a Pioneer club that was poorly insulated from the icy wind. The artists were warmed only by thoughts of their fee and alcohol, which, combined, sparked a fit of self-criticism. Komar and Melamid were distressed about having to betray their principles for the sake of filthy lucre, since by that time they were established figures in the world of unofficial art. It was then that they hit upon the idea of a new avatar – an imaginary artist who would do the task from the heart, not the head. 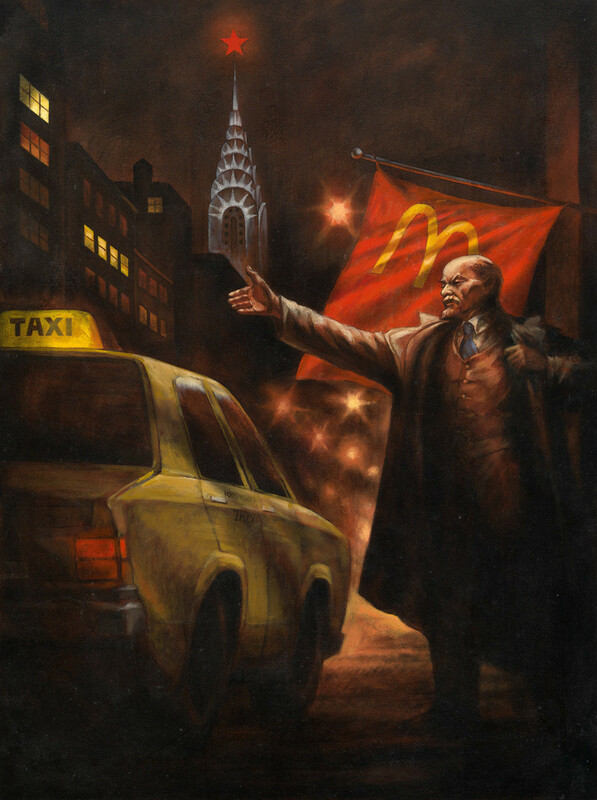 Thus appeared the fictional socialist realist “Komar and Melamid.” The artists fell asleep that night with the feeling of having made a great discovery, and so it was. For they had unwittingly stumbled upon what might be called the direct predecessor of postmodernism, with its yearning for travesty and parody. Bubbling with inspiration, the young creative duo set about breathing life into the works of their fictional artist. They signed their names under famous Soviet slogans; they portrayed themselves as Lenin and Stalin, and their family members as heroes in propaganda posters. To some extent, what Komar and Melamid did was to create memes before the term existed. The artists lifted the lid on the fake nature of socialist realism, ridiculing the Soviet ideology that had become a parody of itself. They created performance art that could not be perceived other than as political blasphemy. For example, they fried Pravda “meatballs” to “partake of spiritual nourishment.” And at a home show, they played the roles of Lenin and Stalin, directing audience members supposedly tasked with painting a great work of socialist realism. All those present were subsequently arrested. Nevertheless, sitting there in the police station together with the father of non-conformism Oscar Rabin, they decided to put on a display of unofficial art, which became known as the Bulldozer Exhibition. 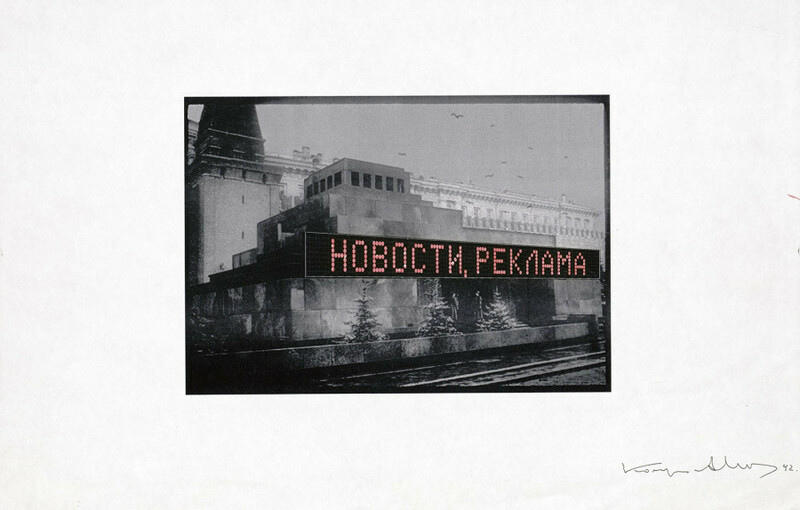 Komar and Melamid were among the initiators of the Bulldozer Exhibition – a showing of underground artists on a vacant lot outside Moscow. Dissident artists were banned from official state exhibition halls, so they were forever on the lookout for alternative ways to display their works. Twenty people in all took part. Suddenly, a group of KGB officers turned up disguised as landscapers and began to smash up the exhibition. A bulldozer arrived and literally pulverized the paintings. Monumental Propaganda exhibition, 1992. The creeping line says "News, advertising"
Western newspapers got wind of the incident and described the act as a violation of the recently signed Helsinki Accords. 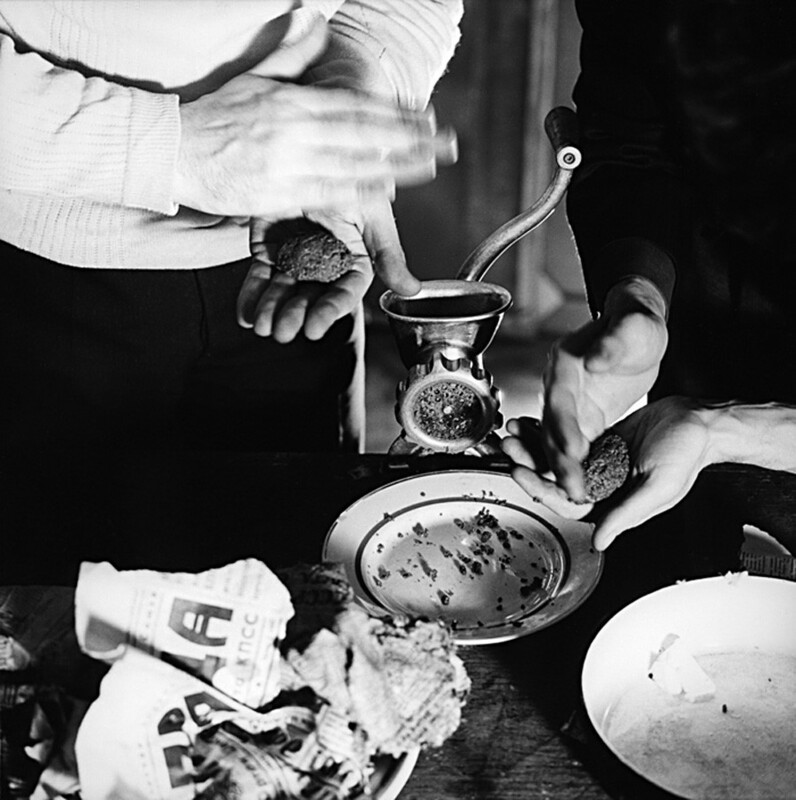 Komar and Melamid decided to emigrate – first to Israel, then to New York, where they have been living for 40 years. Having relocated to New York, the artists turned their critical, satirical eye to Western living. Their first target was the art market. A headline-grabbing piece of performance art saw them set up a “corporation” that bought and sold human souls, gently mocking the cult of capitalism, in particular the cliché that artists invest their soul in their work, only for galleries to sell it for 50 percent of the takings. Among those who sold their soul to Komar and Melamid was Andy Warhol himself, who valued his spiritual self at a whopping $0.00. The artists later joked that this was because it was not the first time he had sold it. Despite having left their Soviet homeland, Komar and Melamid remained engaged in sots art. In the West, the artists discovered the fallow lands of academic painting. They repainted pictures, introducing 20th-century political figures into salon scenes, among them Lenin, Stalin, and Hitler. 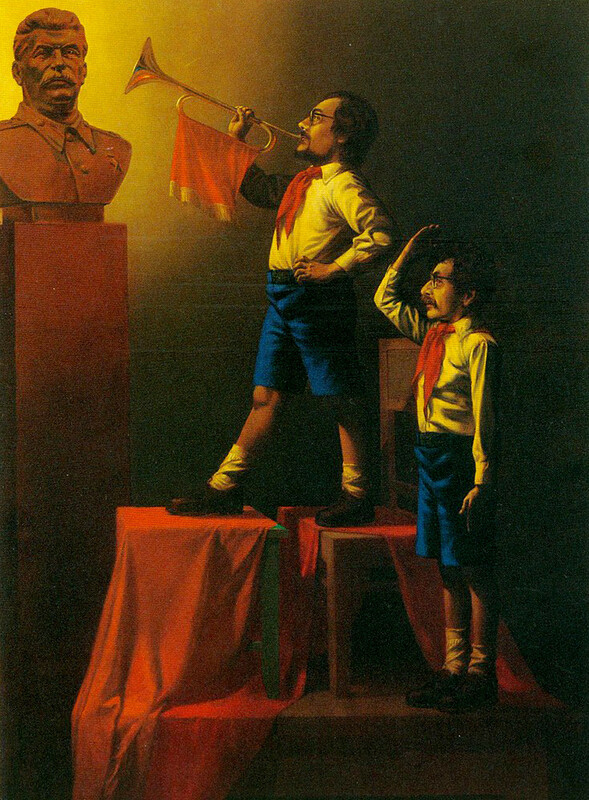 This postmodernist hybrid of academism and socialist realism rode the 1980s wave of perestroika. Western gallery owners reached out to the artists. Their exhibitions were held worldwide, and their works were acquired by leading museums, including the Metropolitan and MoMA. 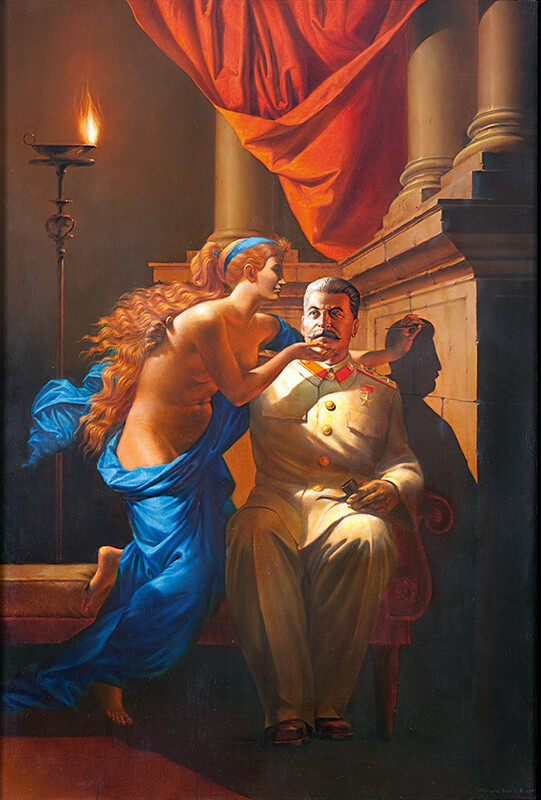 After the collapse of the Soviet Union, the socialist realist artist “Komar and Melamid” ceased to exist, although the two remained together for a while longer. In the 1990s, their “Painting Elephants” project became a smash hit. A parody of modernism, it came about after the pair viewed the late abstractions of Gerhard Richter and concluded that elephants would be able to paint no worse. 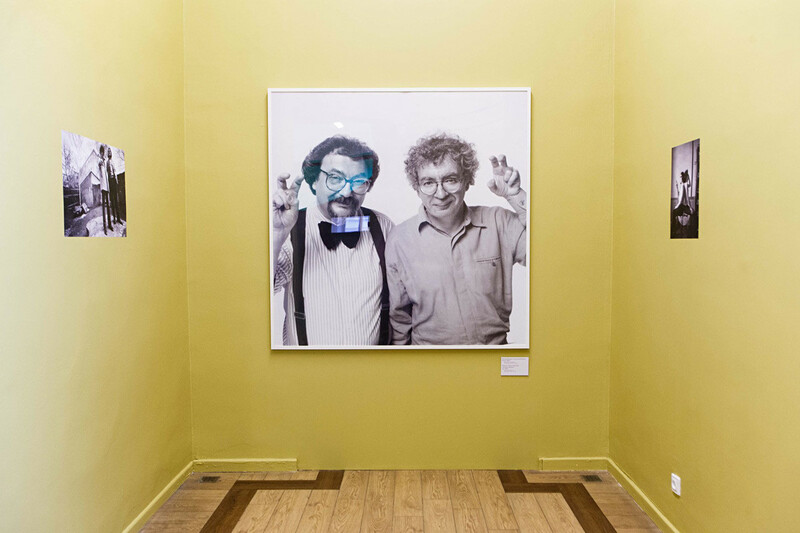 Komar and Melamid’s last works, among them the “People’s Choice” and “Monumental Propaganda” series, lost none of the duo’s trademark wittiness or zeitgeist relevance. However, in 2003 the duet broke up, and the artists embarked on solo careers. 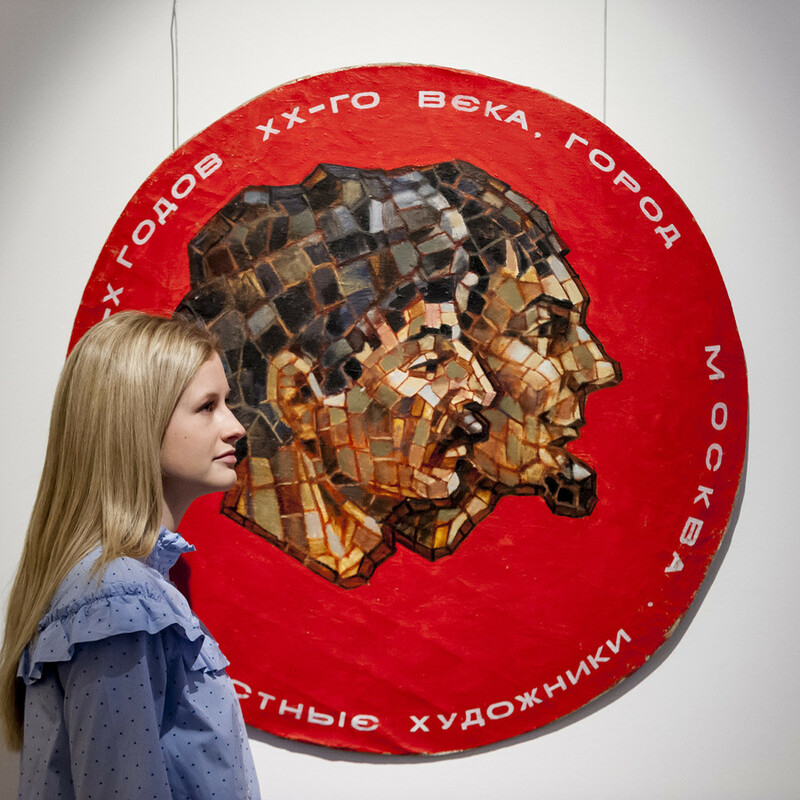 The retrospective exhibition“Komar & Melamid” runs at the Moscow Museum of Modern Art (25 Petrovka Street) until June 9, 2019.